Analog Artist Digital World: The Eye is open on International Drive. The skeletal structure of "The Eye" is visible from miles away. It is as large as the huge Ferris wheel in London.It is part of a large new development which includes many new stores, restaurants, and an aquarium. When I did this sketch, the eye wasn't yet completed, but now it has all it's cars in place and the neon lighting illuminates the structure at night. 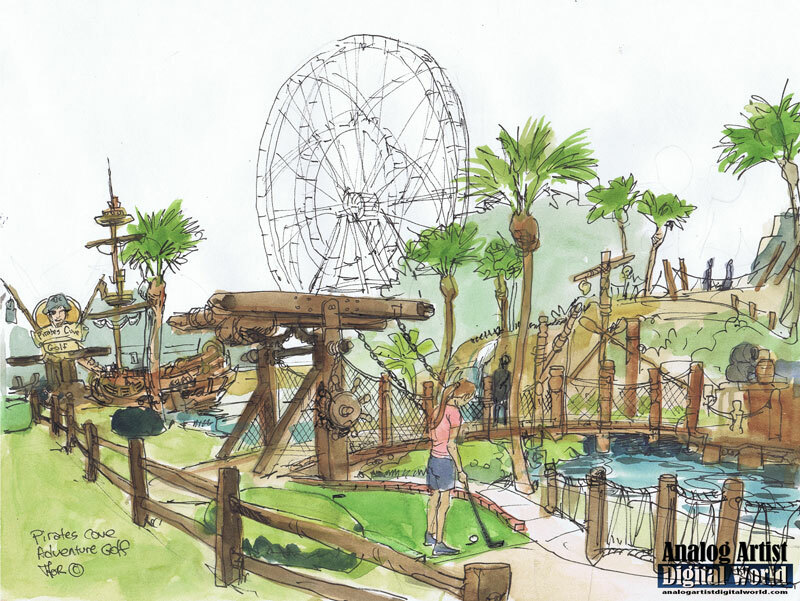 It is clearly visible from I-4 although it is a quarter mile from the high way The Pirates Cove Adventure Golf course is right next to all the development on International Drive and it was business as usual with families battling with each other for bragging rights. International Drive does tend to showcase an International assortment of tourists. If you sit in one spot for several hours, you will hear languages from around the world. The water in the lagoons on the course are an u n-natural shade of turquoise even in the cascades of a water fall. I didn't notice any pirates but their ship had run aground so they must have been either on board, or on the course swilling liquor from the many wooden barrels. Landscaping on the course was immaculate, and there was a steady stream of players.